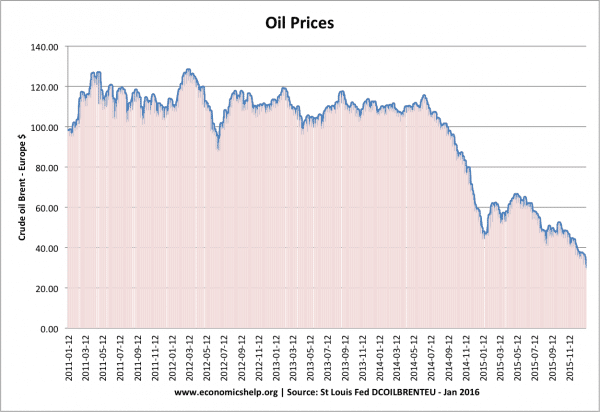 Home > Economics help blog > oil > Are falling oil prices good for the economy? Are falling oil prices good for the economy? In recent months, we have seen a dramatic drop in oil prices. For many consumers and business, this fall in the price of oil will be welcome reduction in the cost of living and a reduction in the cost of business. However, is such a steep fall in oil prices good for the economy? In normal economic circumstances, a fall in the oil price can help the economy. Lower oil prices reduce the cost of transport and lead to lower costs for business, which can increase profitability. This fall in oil prices helps to reduce inflation. The combined effect of lower prices, more spending power and lower costs of business can help boost economic growth. 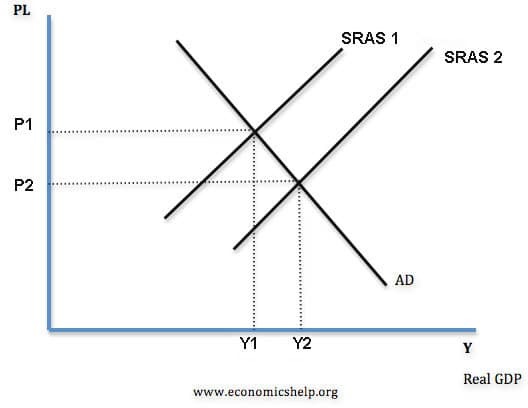 Falling oil prices, shift SRAS to the right, creating a double benefit of lower prices and higher real output. With lower oil prices, Central Banks have a better trade-off between inflation and unemployment. With falling prices helping to reduce inflation, Central Banks can keep interest rates lower without the risk of headline inflation. Sometimes it is said that a fall in oil prices is like giving consumers a tax cut, and this has the same effect as expansionary fiscal policy. If petrol prices fall 10%, then consumers will spend less on petrol / getting to work and have the ability to spend this extra discretionary income on other goods. Therefore, the fall in oil prices can lead to higher consumer spending in other areas of the economy. But, are falling oil prices good for the world economy? Usually, a moderate fall in oil prices could be a fillip to both developed and developing economies who consume oil. However, there are fears that this particular fall in oil prices could start to actually become damaging – even for oil importers. The problem is that this particular fall in oil prices is causing economic hardship. Prices have fallen so much that oil companies are going out of business. Areas, such as North Sea Oil, oil extraction from the Arctic and other high-cost areas are now no longer economic. Firms have no option but to cut back on production and lay off workers. Even OPEC countries, such as Saudi Arabia are feeling the crunch. If countries like Saudi Arabia are forced to pursue austerity, it will reduce flow of global capital (both short-term capital and long-term investment). The danger is that with many oil-producing economies facing recession, it could be a tipping point which leads to a slow down in global economic growth. Directly, Western consumers benefit from lower oil prices (although the reduction in petrol prices is less than fall in oil prices). However, indirectly, there is a danger that the global economy could be derailed by bankrupt firms, bank losses and a decline in global confidence. A small fall in oil prices wouldn’t hit oil countries too much. But, this time, the fall in oil prices is so severe, that oil producers will be hit much more than previous oil price falls. If we had high inflation, a fall in oil prices can help inflation become closer to the government’s target of 2%, but with inflation already close to zero, falling oil prices are not helping reduce excess inflation – they are in danger of causing outright deflation. If we get deflation, then it can cause many problems in the economy, such as debt deflation, rising real interest rates and rising real wages. Falling oil prices could help embed deflationary pressures in the economy. One final point, many consumers are happy at lower prices. But, evidence suggests that consumers are responding to a fall in petrol prices by driving more. A 10% increase in traffic levels on UK’s crowded roads could cause very significant problems of congestion. It may be cheaper to drive, but it may well take much longer to travel anyway. Falling oil prices would be a perfect time for the government to raise revenue from increasing petrol tax and cut tax on North Sea Oil producers. Falling oil prices could have benefits of encouraging firms to stop oil extraction from new areas. But, on the other hand, lower oil prices are encouraging consumption. Also, falling oil prices could harm the growing markets for renewable energy and reduce the attractiveness of cars which use alternative fuel sources. The problem of falling oil prices will be felt most significantly by oil producing countries and oil companies. The fall in oil prices will lead to lower revenues and a deterioration in their current account. Countries such as Russia, which relied on oil for significant parts of GDP and tax revenues have been hard hit by falling oil prices. They have seen a rapid devaluation in the Rouble, (causing inflation and a decline in living standards) For oil exporters, a fall in oil prices leads to a worsening current account deficit. Other countries, such as Venezuela also relied on oil revenues to fund many social programs, with falling oil prices, there aren’t sufficient funds to meet the requirements of social services, such as health care and education. In the short term. oil producers like Venezuela and Russia face an unwelcome combination of falling tax revenues, devaluation, inflation and a decline in living standards. However, the fall in oil prices is forcing the economies to diversify and invest in industries, such as manufacturing and agriculture. In the long term, this could lead to benefits as it is always dangerous to have an economy reliant on one commodity, such as oil. Countries which rely on oil exports, can suffer from a phenomena known as the “Dutch Disease” So the painful re-adjustment may be worth it in the long-run. Usually falling oil prices have been beneficial for the global economy. However, this time is different because the oil price is falling to a level which is making most oil production uneconomic. Many oil producers are likely to lose significant amounts of money. This unprecedented losses could have serious effects for global finance and the state of the global economy. This will outweigh any benefits consumers and firms may notice from cheaper petrol prices. This entry was posted in oil and tagged energy, oil. Bookmark the permalink. ← Why are UK house prices so high? on the short term europe will benefit from it but on the long term it will harm us. Ex: If the devaluation in the Rouble is big this could lead to a lower import of foreigns products in Russia such as apples from belgium. This could shift the IS curve to the left with a lower National income for Europe as a result. Nobody has mentioned the impact on many consumer goods. Given the extensive use of petroleum products in electronics, food industry packaging, clothing, home goods, etc, prices should be reduced significantly. This should prove to be a boon to retailers and banks since the average consumer has more disposable income.